Momo Challenge: Another Blue Whale in the making? WTN- The Blue Whale challenge, a game that shook the Internet, took several young lives across the world a year back. Many urgent legal and policing measures were taken up in earnest to quell the dangerous fad which had gripped millions of youngsters. Today, on the same pattern, we have another challenge that is spiraling into an equally dangerous trend that can be detrimental to lives. 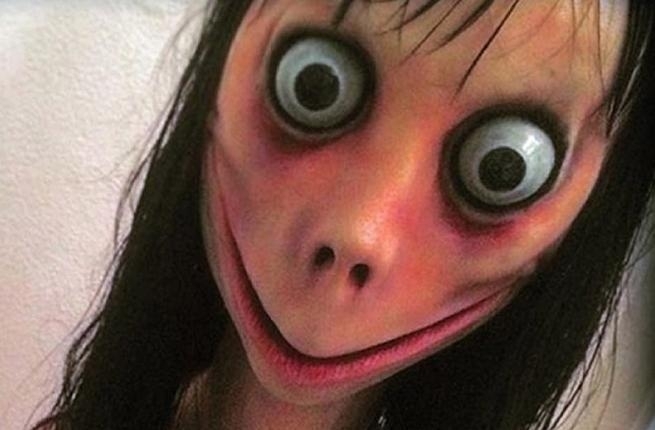 The virtual world is agog with Momo Challenge, a game that incites harm to oneself. Through different stages of the game, challenges are set for the participant and he/she has to surmount those challenges to reach the apex. At the end, the last challenge is to commit suicide. The game started about a month back and went viral on social media like Facebook and Whatsapp wherein members are challenged to communicate with an unknown number (purportedly of Japan or Columbia). It is a form of cyber bullying in which scary graphics are circulated as part of the game. As per cybercrime experts, Momo Challenge is nothing but a hoax aimed at stealing vital personal information. It has taken many lives in the US and a couple of young lives in India too. The government has recently issued guidelines to states to take steps that lessen the craze of students towards this trapping. The Ministry of HRD has asked the respective state education departments to monitor the online activities of school students. But the onus essentially lies with the parents. Parents have to be very careful of their children’s activities online and their behavioral changes if any because any such change may indicate dependence on or influence of some external force on them. Today most adolescents in urban homes use the Internet and mobile phones extensively and hence their exposure to the social media is unlimited. Impressionable minds are prone to get attracted to queer ideas and misadventures. Unless they are monitored and guided, they are vulnerable to fall in the trap of evil designs. Parents are often too busy to keep close track of their children’s inclinations, activities and behaviour trends which is the most dangerous loophole in parenting. It takes no time for children to take to wrong habits and it is tough to wean them away, which is why early intervention is essential. Disciplined use of social media is a mandate the kids must be told in clear terms. Excessive use must be stopped because social media is the root of several potential dangers as it intrudes into the personal space and influences actions. Let alone children, even adults get swayed by such influences, which is why it is important for everyone to keep the use of social media in control. It is almost impossible to ban and block sites and internet access is a free democratic society. In any case, everything convenience in society has its set of pros and cons and it depends on the wisdom and judgment of the user whether he uses them for his benefit or becomes a slave of those conveniences.